When Herschel Walker left the University of Georgia after his junior year to join the United States Football League, it was an unprecedented move that made national headlines. Underclassmen were prohibited from joining the National Football League at that time, though Herschel appeared ready to challenge that in court, and would probably have won. In the end, it didn't matter, because the U.S.F.L. had no such restrictions, and in 1983, they made Herschel Walker the highest paid football player in history, to that point. The story was such a big deal at the time that former L.A. Express sportswriter, Jeff Prugh, turned out two biographies of Walker during that year. 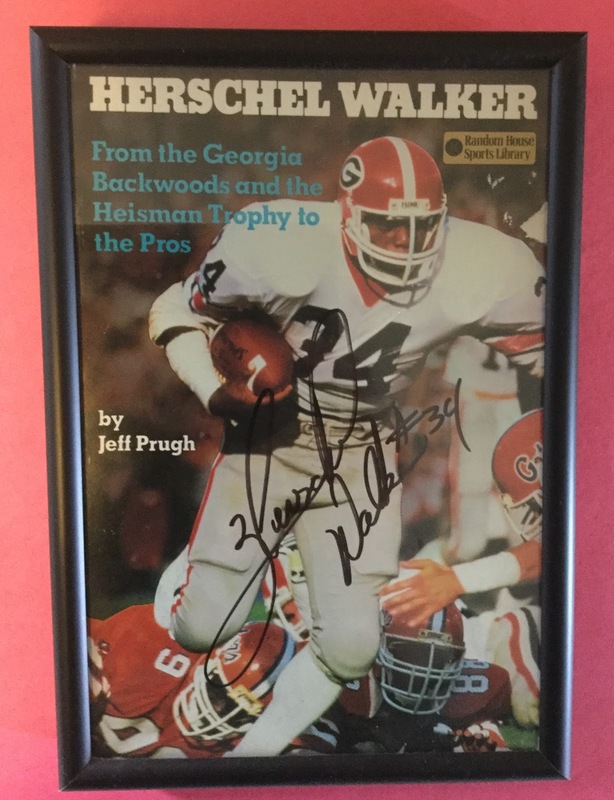 The first, The Herschel Walker Story, came out in August of 1983. Though I watched Herschel on TV from his freshman year in college, I didn't really start collecting his stuff until he was with the Philadelphia Eagles in 1993. Like it is with most single player collectors, I wasn't aware of a lot of items when they first came out. I picked this up years later online. Prugh's second book about Herschel was written for the Random House Sports Library series. 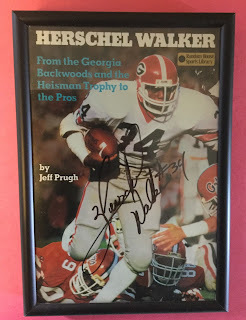 It's entitled: Herschel Walker: From the Georgia backwoods to the Heisman Trophy and the Pros. This book came out in October of 1983. I found this copy at a yard sale in 1993. I sent it to Herschel in care of the Eagles, and though it took about 4 months, I received it back with a sharp looking autograph. I had the book framed and mounted it to display.